From the North, drive south from the A720 Edinburgh city bypass towards Peebles on the A703. At the village of Eddleston take the first right opposite the Horseshoe Inn and drive 200 metres to the gates of the Barony Castle Hotel on the right. Then follow the driveway to the car park. From the South, follow the A68 from Newcastle and Jedburgh. At Galashiels take the A72 to Peebles, then the A703 to the village of Eddleston. Take the first left opposite the Horseshoe Inn and drive 150m to the gates of the Barony Castle Hotel on the right. Then follow the driveway to the car park. By bus: Take Borders Bus X62 which commutes between Melrose and Edinburgh bus station. Get off at the Horseshoe Inn, Eddleston. 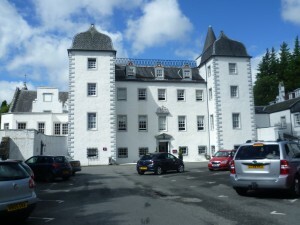 Walk 150m to the gates of the Barony Castle Hotel. Then follow the driveway to the car park. The owners of Barony Castle Hotel have supported Mapa Scotland’s endeavours every step of the way.